Nasturtiums have been grown in gardens for centuries in Europe and America. The first species known in Europe was collected from Peru. It was grown by Gerard and is illustrated in his Herball dated 1596; modern botanists call it Tropaeolum minus. 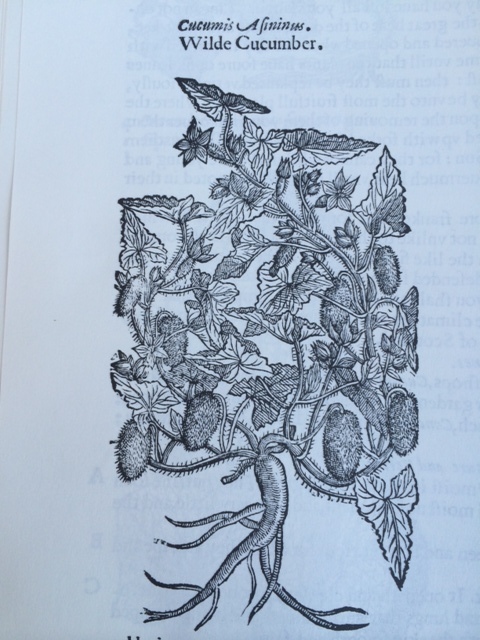 He named the species Nasturtum indicum and his illustration showed a plant wound about a stake. The plants he grew had yellow flowers. He mentions that some people of his time thought nasturtiums to be a form of bindweed, which means they had a somewhat vining habit. Gerard writes “…one plant doth occupie a great circuit of ground, as doth the great Bindeweede.” In Gerard’s time nasturtiums were considered a warm season vegetable, with the virtues of the various kinds of cress. 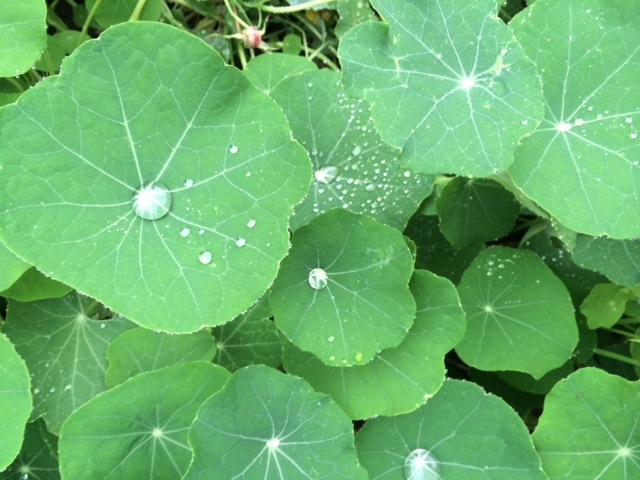 In most literature on nasturtiums, T. minus is described as growing only 12 inches to 18 inches high and across, while T. majus is said to reach six feet wide. Tropaeolum majus arrived in England sometime in the 1600s. It was likely to have been used for its flowers rather than as a vegetable. T. majus grows into a larger plant than T. minus and has a distinctly vining habit. Hybrids with the two above species and T. lobbianum extended the color range and variety available over the centuries. Once there were several dwarf “Tom Thumb” varieties, but they seem to have disappeared. The oldest varietal seed strain I could find is ‘Empress of India’ dating to 1889. This year I grew a rare surviving seed strain of nasturtiums from the 1890s named ‘Phoenix’. Its flowers are illustrated in the first photo above. This strain produces a mix of bloom colors in beautiful warm shades splashed with darker colors as in T. minus. The flowers have beautiful serrated edges. The catalog I purchased seeds from listed ‘Phoenix’ as an example of T. minus, but I believe it to be a hybrid between species, for its plants are very large. This heirloom variety is open-pollinated. 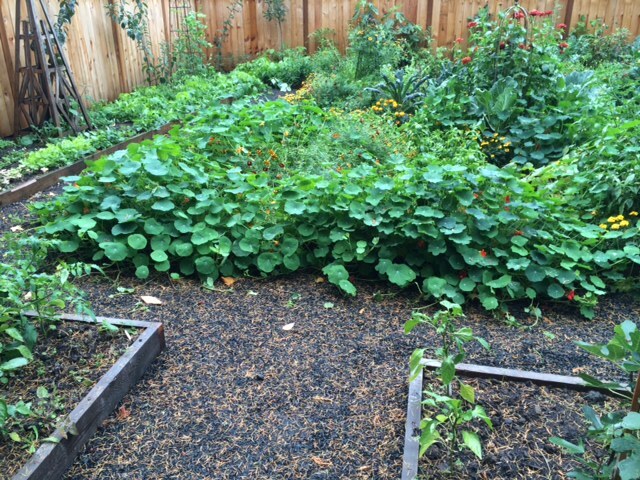 In third photo above I show newly planted ‘Phoenix’ nasturtiums, as a border on the left square bed. In the fourth photo I show how large the plants are now, October 25th. Some runners from the plants reached six or seven feet. 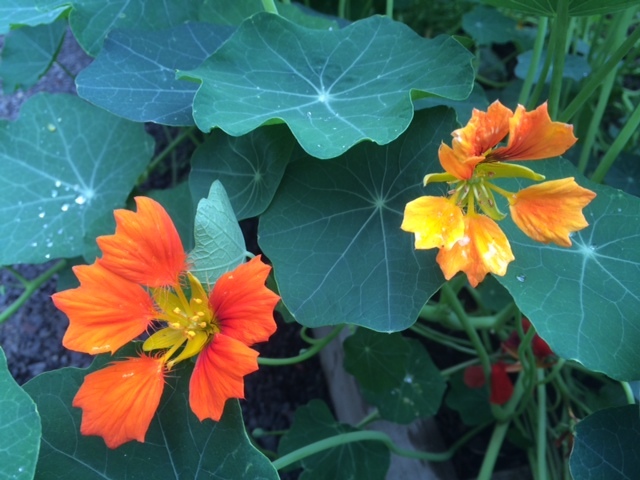 I recommend trying ‘Phoenix’ nasturtiums and also suggest you save seeds, for the variety is very rare. Also, be sure to give the plants a lot of room; perhaps three to four feet in all directions. Hanging baskets made with these and antique blue Lobelia erinus ‘Crystal Palace’ from 1867, might be quite beautiful. Impatiens balsamina, a flowering annual, has been grown in gardens for many centuries. It is native to India, China, and Malaysia and reached Europe as early as 1542. The woodcut directly above is taken from Gerard’s Herball of 1596. It is a good representation of the seed pods which appear on the plants as the end of their season. 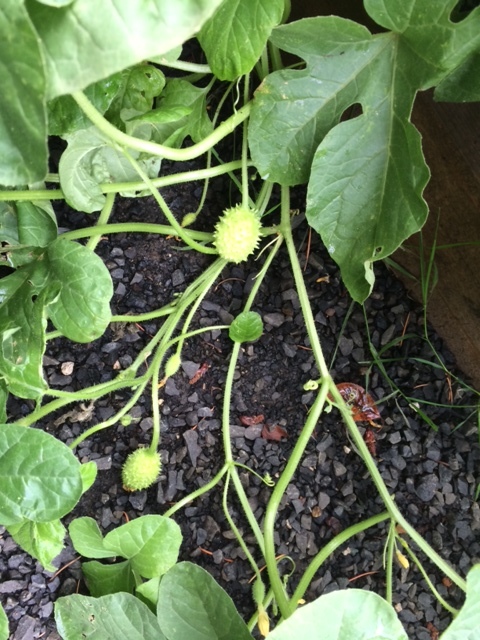 Above the woodcut, I have included a photo of the seed pods from my own garden. Early gardeners and botanists thought balsam was related to cucumbers because of the similar seed pods. Gerard lists at least eight names by which the plant was known in his day and that is an indication it probably was widely known and grown. The first mention of balsam in America is from 1760 by J. Townley in The Boston Evening Post, March 31 of that year. In the early eighteenth century only single-flowered varieties of balsam were available. Double forms appeared in 1768 as mentioned by Philip Miller in his Gardener’s Dictionary. His seed came from the East Indies. The color range available increased and balsam was a popular garden plant. I grew an antique Victorian seed mix this season dating to 1863 named “Camellia flowered”. 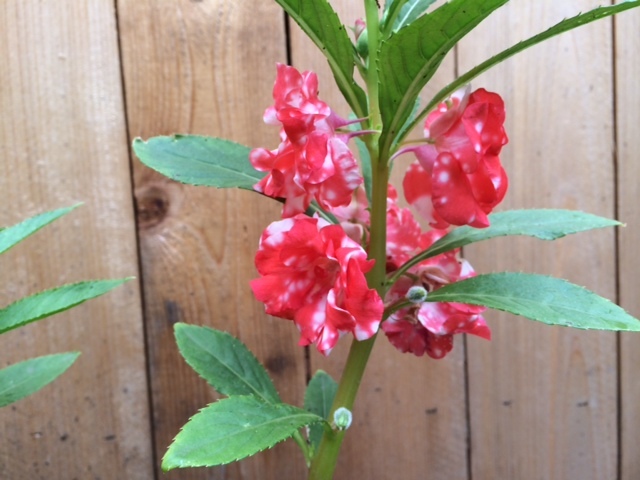 The flowers are large and mostly double, with a wide color range (the first three photos above show several different colors). The individual flowers are beautiful and really look like miniature camellias. 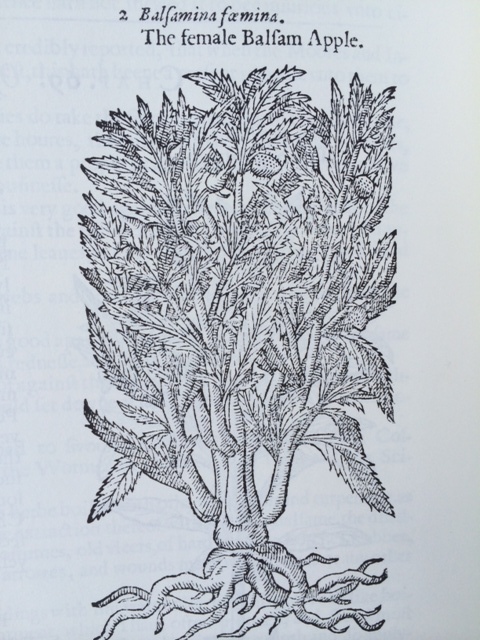 This seed strain was very popular in the nineteenth century. Balsam is a heat-loving annual and enjoys warm summers. Early gardeners started seeds in hotbeds in frames made with fresh manure. 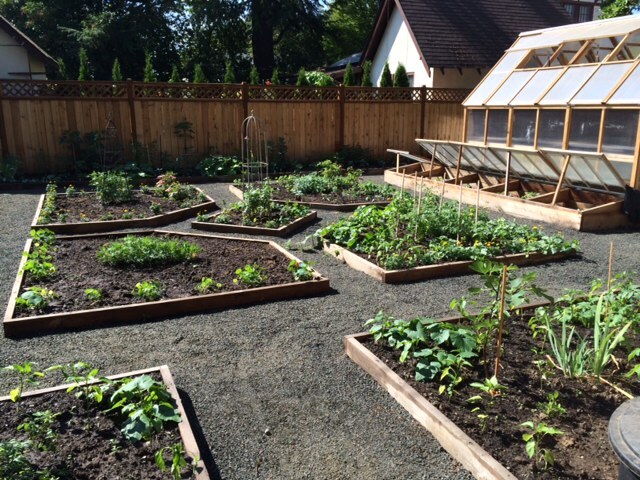 As the manure aged and composted it heated, thereby providing a warm environment for the young plants. The plants were then set out into the garden after all danger of frost had passed. Today, we can start balsam indoors in warm conditions in a greenhouse or under lights at about 77 degrees. After the seedlings are large enough to transplant, it is best to put them into individual pots as they grow fast. Balsam enjoys regular water in pots and in the garden, so cannot be considered drought tolerant. The plants seem to like about as much water and similar temperatures as do tomatoes. 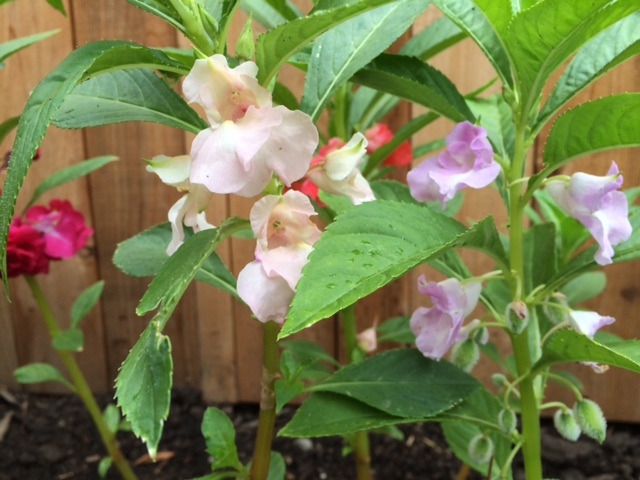 Here in Oregon we had the hottest summer on record and my balsam plants did very well. I grew them in Montana in the 1980s, but the cool nights, short season and dry air really shortened their bloom season. Though related to the commonly grown impatiens, balsam grows best in full sun. I definitely recommend trying balsam in your garden, for they are not often seen today. This year I grew some very old heirloom vegetables. 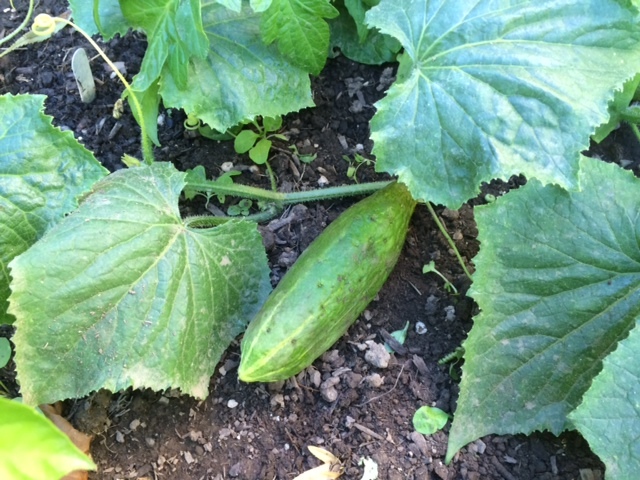 The first picture above is a photo of my plants of ‘Jamaican Burr Gherkin’ a cucumber from Jamaica, originally from West Africa. The seed company I purchased the seed from gave a date of the 1500s. 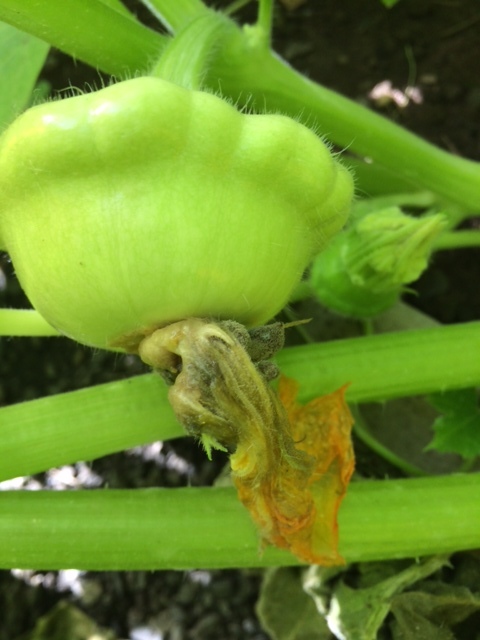 The fruits are small, spiny, with a mild, slightly tangy flavor and began ripening in about 70 days. This variety is excellent for pickling. A plant with similar, spiny fruit is depicted in a woodcut illustration in Gerard’s The Herball published in 1596 in London, as ‘Wilde Cucumber’. The leaves in his illustration, however, are not deeply cut and lobed as they are in ‘Jamaican Burr Gherkin’, but have a slightly jagged edge. They are more similar to what Gerard shows as ‘Citrull Cucumbers’. 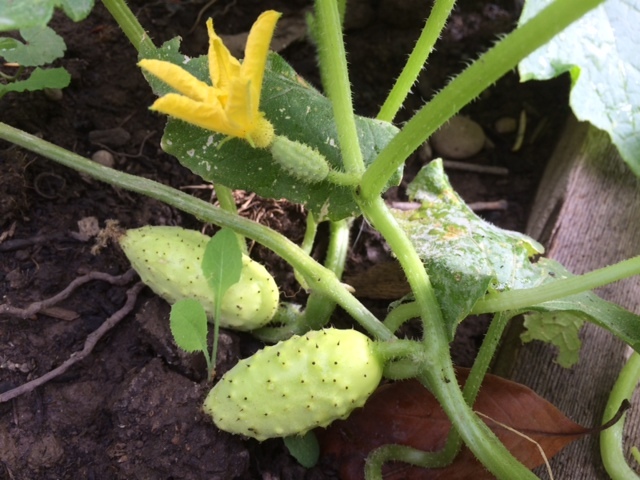 The citrull cucumbers are early yellow cucumbers with watermelon-like leaves, just as those of ‘Jamaican Burr Gherkin’. The third illustration is my photo of ‘White Scallop’ summer squash. This squash is excellent baked or fried and has flat fruit with scalloped edges. It is known to be a Native American variety. 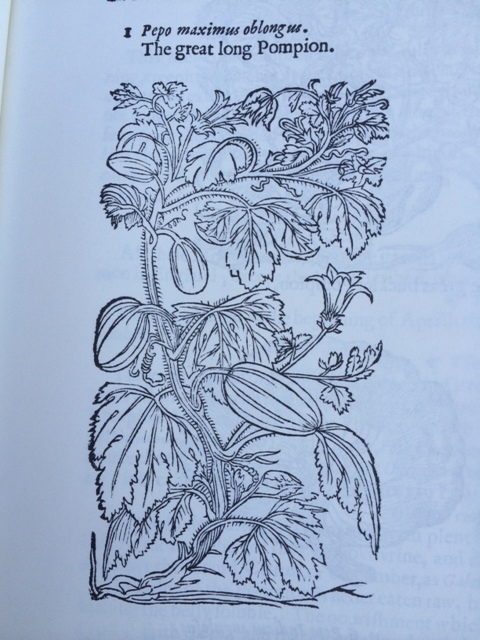 Gerard provides a nice illustration of what is probably the very same plant. He calls it ‘The great Buckler Pompion’ (fourth illustration). The growth of the plant is very large, maturing early. It continues to bloom and set fruit for a long period. The fifth illustration is my photo of ‘Long Pie Pumpkin’ known since at least 1832 in New England. It the garden it spreads quite a distance, has large, deeply cut leaves and seems to continue to bloom and set fruit a long time. This variety can be picked while still green and will ripen in storage. It is rather rare today. 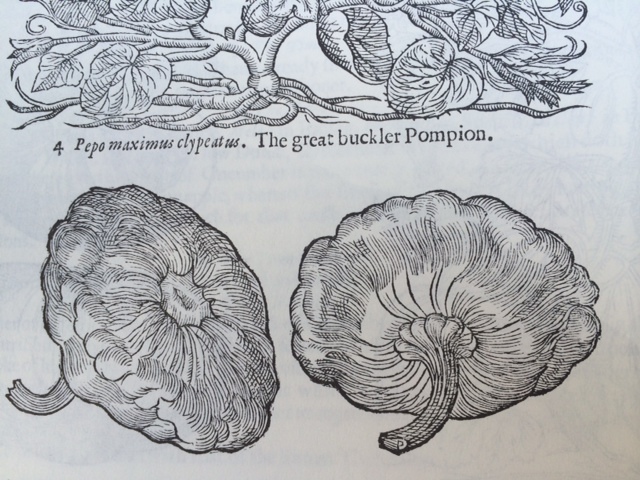 Gerard shows a somewhat similar variety in a woodcut labeled ‘The Great Long Pompion’. In his description, he says the meat next to the rind is white, and the interior spongy and slimy. He mentions that the fruit ripens green or gray, while our variety ripens orange. It is important to preserve these ancient heirloom vegetables that are so rare today. They are all open-pollinated, so seed can be saved for next season. If you do save seed, be sure to research about seed cleaning, saving and storage and check the isolation distance required to prevent cross-pollination with other varieties, which would dilute the genes of the variety you re trying to preserve. 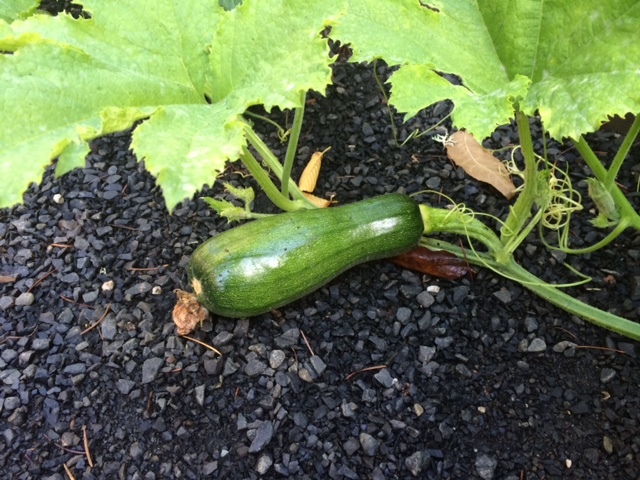 This season I grew several heirloom cucumbers. All of them are open pollinated so seed can be saved and planted next year. The first of my cucumbers to ripen was ‘Boothby’s Blond’ (top photo) a variety handed down over generations by the Boothby family in Maine. The date is unknown, but I would guess nineteenth century. It is a lemon-type, rather small, but quite mild and delicious. The plants produced well and began early. 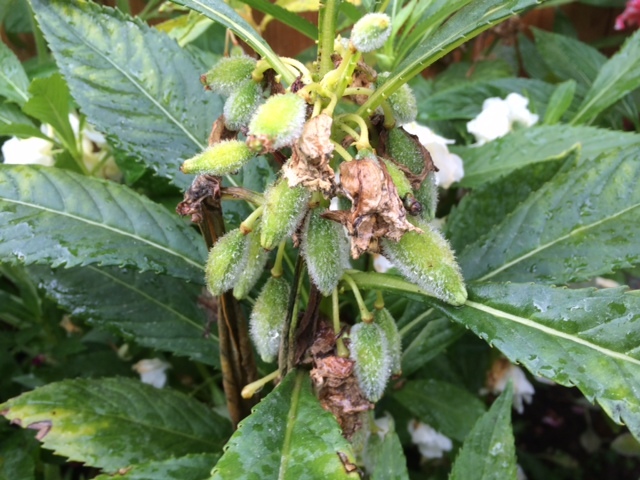 One failing is that the plants developed powdery mildew earlier than other varieties, and this eventually weakened the plants causing them to slow production. My garden is in shade for the first half of the day and that is part of the problem. 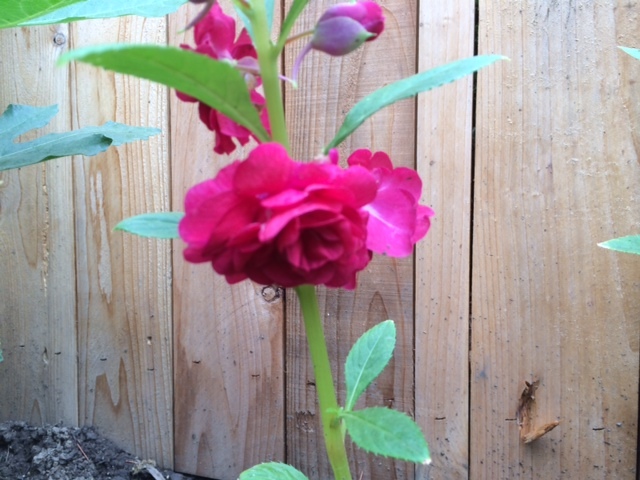 I garden organically and use a soap spray to control mildew. It slows down the spread of mildew, but does not kill it. Anyway, I would recommend growing ‘Boothby’s Blond’ cucumber. It is great tasting, early (50-60 days) and productive. Just try to give it as much sun and air as possible to prevent disease. Another good heirloom cucumber I grew this year is ‘Parisian Pickle’ from 1880 (middle photo). This variety is listed to mature in 50 days. 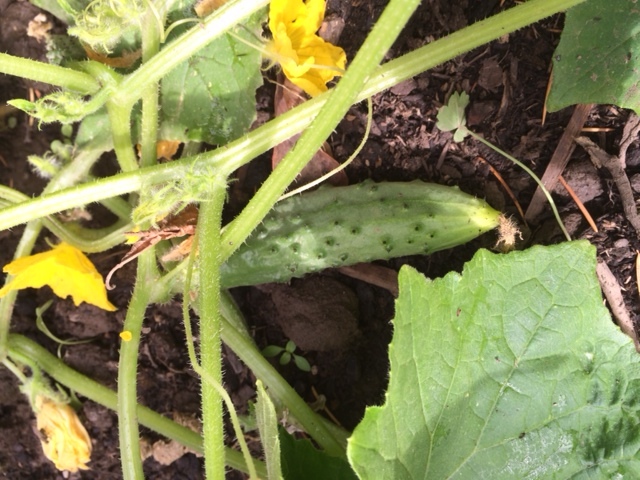 Now that is true if you pick the cucumbers small, which you might want to do because the fruits grow large quickly. We used this variety for slicing and were about to make pickles when rats appeared and ate all the cucumbers in the garden. I suppose they are traveling all over town trying everyone’s cucumbers. ‘Parisian Pickle’ is very productive and fast-growing, but the leaves also developed powdery mildew a couple weeks after ‘Boothby’s Blond’. In the bottom photo is a cucumber grown since the era of the Oregon Trail, 1830-1869. It is ‘Long Green Improved’ from 1842. It is listed as maturing in 70 days, but I found it to be ten days earlier. (This could be due to weather; we had the hottest summer on record here in Oregon). The skin of the fruit of ‘Long Green Improved’ cucumber has few spines so is smoother-skinned than the previously mentioned varieties. It is an excellent slicer with mild flavor that can be used for pickling when picked small. Best of all, my six plants of this variety still show absolutely no mildew on October 5. That means this variety will tolerate slightly shadier or more close conditions than the other two. The fruits will grow to 12 inches or more if allowed. This is a great variety that should be saved from extinction. Why not try it next season?